Tales from the road, recounted state by state...and now, country by country. 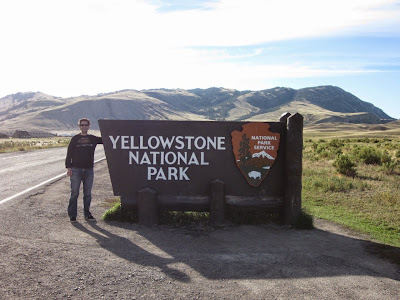 My first visit to Wyoming was during my inaugural cross-country trip in the summer of 2000. That's when I started referring to Wyoming as The State that Time Forgot. Where else does the local convenience store sell giant blocks of ice and coke in authentic (not retro) glass bottles? 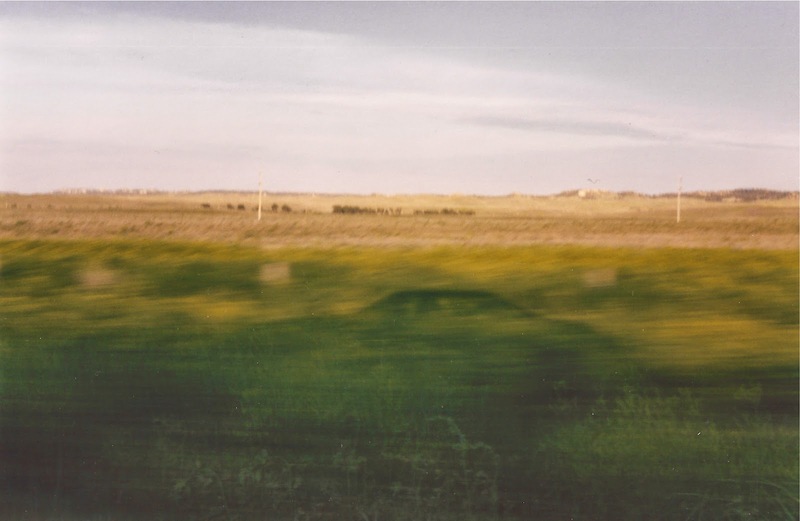 We were just passing through, so other than the anachronistic convenience store, my only memories are of the prairieland grass we drove by for hours and a quick stop in Cheyenne to call Cheyenne, my girlfriend at the time. She didn't pick up. My second visit to Wyoming was epic. It was a major stop on the trip Mrs. Tires and I took from Chicago to Seattle in the summer of 2014. 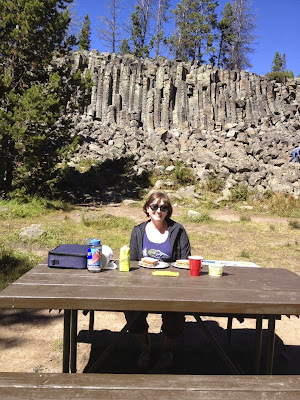 Our ultimate destination in the state was Yellowstone, but the visit started with a jaunt over to Devils Tower. 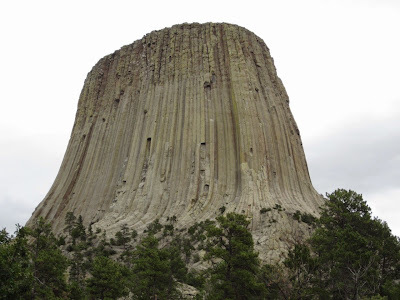 Devils Tower is a bizarre rock formation in the eastern part of the state. There's an entire national park that houses it, the aptly named Devils Tower National Park. 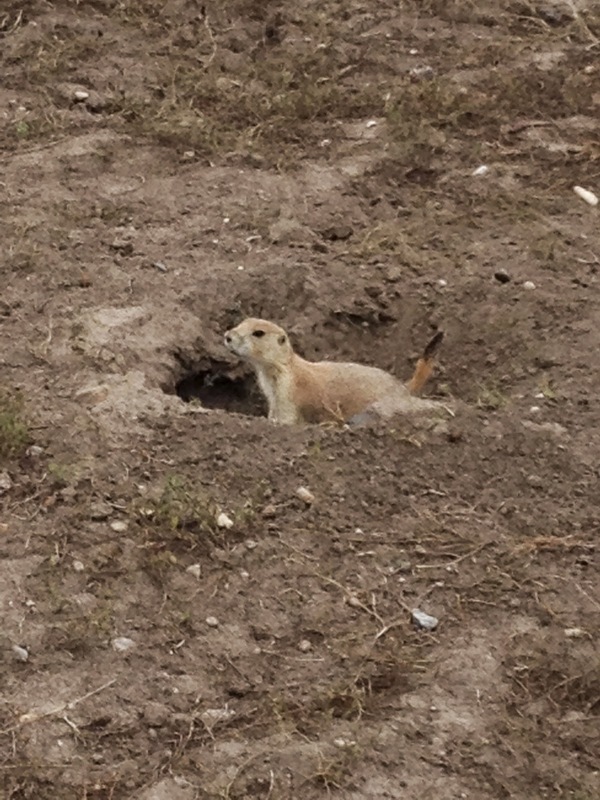 Don't skip the prairie dog town near the entrance - I could stand there and watch prairie dogs bark and chirp at each other from their respective holes for hours. An Indian chief's wife is stolen by a giant bear. To rescue her, the chief turns into a gopher and burrows into the bear's lair. He rescues her, but the bear witnesses the rescue and gives chase. Conveniently, the chief's brother is in the habit of carrying a magic rock with him at all times. When he sees the bear chasing the chief, he sings into the rock and the rock becomes a tower, leaving the trio at the top of the tower and out of reach from the giant bear. The bear makes several attempts to access his escaped pray, but is unsuccessful. The claw marks make up the ridges that surround the tower. Mrs. Tires and I had just come from Mt. Rushmore and it had been a long, rainy drive from the presidents to Devils Tower. 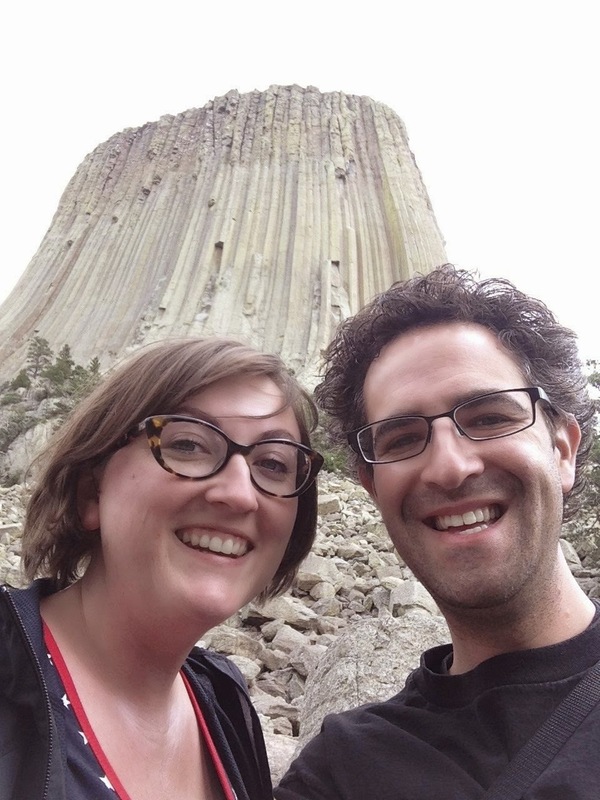 We still had a lot of driving to do that day, so we settled for a stop at the prairie dog farm and a drive straight to the tower, which is in the center of the park. You can drive right up to the tower, and many take the hour long minute hike that circles the base. Anxious about the late hour, we decided to skip the hike and just spend a few minutes at the base taking photos and stretching our legs. We would have loved to have done the hike, but it will have to go on the "next time" list for now, as we had an even more exciting destination in our sights. 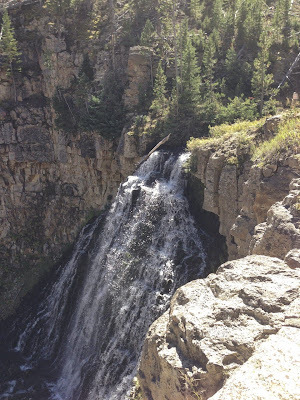 I had been looking forward to visiting Yellowstone my entire life, and it did not disappoint. 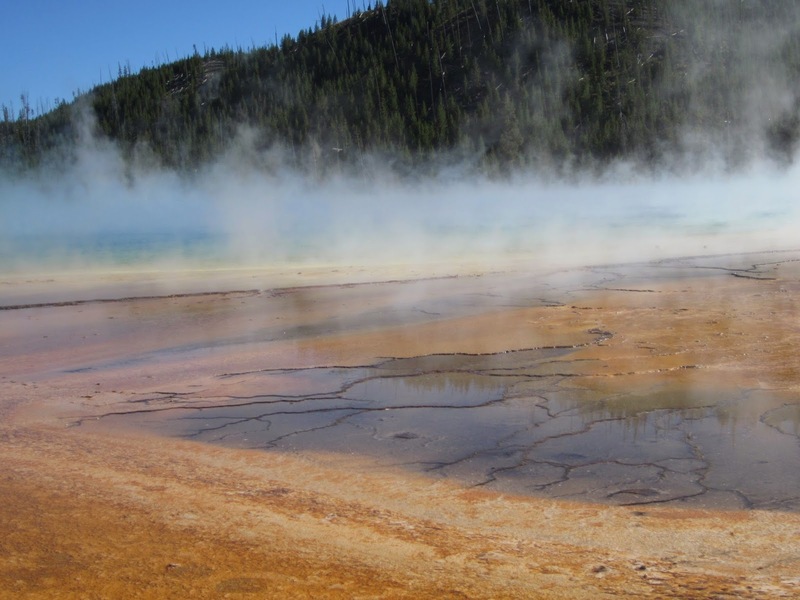 The park is as bizarre as it is beautiful, with strange colored pools and steaming geysers interspersed throughout the pristine wilderness. 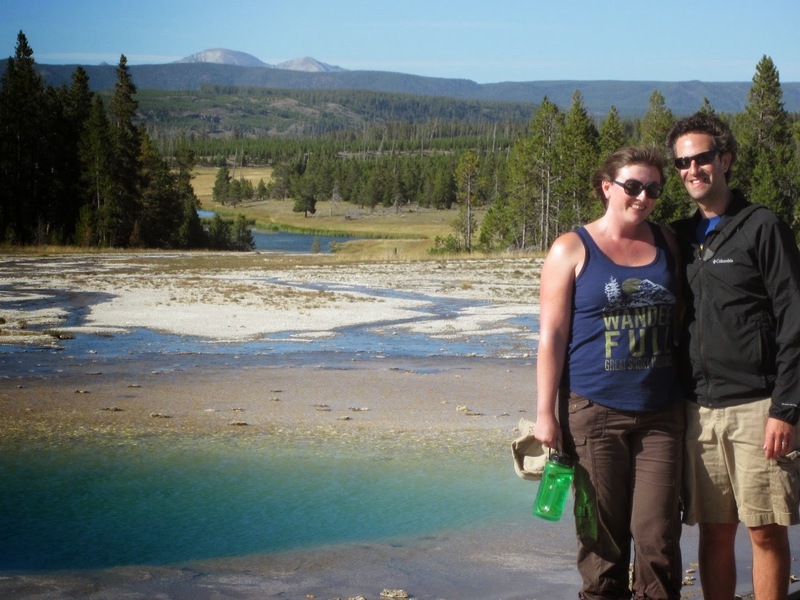 We gave Yellowstone a thorough exploration and loved (almost) every minute of it. 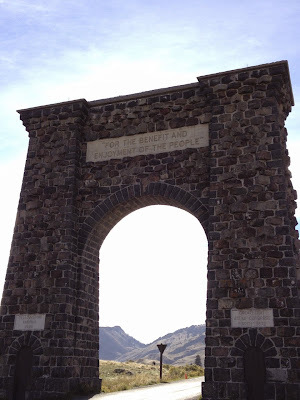 Our trip to Devils Tower took its toll on the schedule, so we ended up entering Yellowstone after dark. Not wise. The drive from the entrance to our lodging required us to navigate narrow curves in pitch black, with the ever-lurking presence of elk and other wildlife that could jump out at any time. 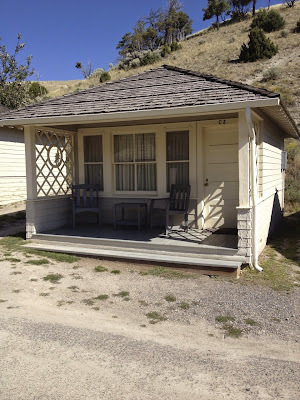 It was nerve-wracking, but we made it to Mammoth Cabins just fine, vowing not to drive Yellowstone in the dark after that. TRAVEL TIP: Consider staying in a cabin if you visit Yellowstone or another large national park. They provide the privacy and novelty of camping without having to sleep on the ground. You're also sheltered from the elements (an actual roof goes a long way), they're typically cheaper than a hotel room, and you usually have access to the host hotel's amenities. Keep in mind that lodging books up fast in the national parks. We booked in February for our September trip and some of the options were already sold out even then. After an effortless late-night check-in, we made our way back to the car, but stopped dead in our tracks when we saw a tall four-legged creature not twenty feet away from us. It was an elk, the first we'd seen. Elks are common in Yellowstone, especially near the Mammoth area. Fortunately this one was female. The males are quite dangerous, especially during rutting season, which just so happened to be in full swing. After admiring the elk for a moment, we heard a sound in the distance that was both truly unique and truly frightening. It sounded like it was straight out of Jurassic Park. Spooked, we ran for the car. We learned later that it was the bugle of a male elk. Fortunately the male didn't catch up to us. Mrs. 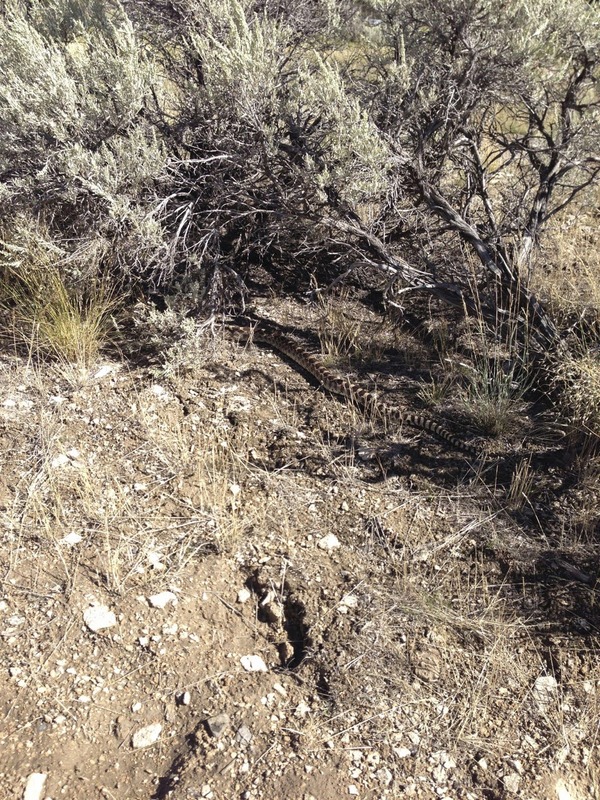 Tires would run into a couple more female elk while on her way back from the camp bathroom later that night. Fortunately, she lived to tell the tale. The next morning we backtracked to the north entrance of the park. We love photographing ourselves next to the iconic signs at the park entrances, but it was too dark for the shot on our way in the night before. I proudly adorned my Yellowstone t-shirt as I stood next to the sign. This was truly dorky, but it's not every day you get to check a major item of your lifetime bucket list. The north entrance also features the Roosevelt Arch, a huge rock structure dedicated by Teddy Roosevelt to commemorate Yellowstone as the first national park in America. I love the inscription: "For the benefit and enjoyment of the people." A simple phrase, and a great reminder of the purpose of the parks. 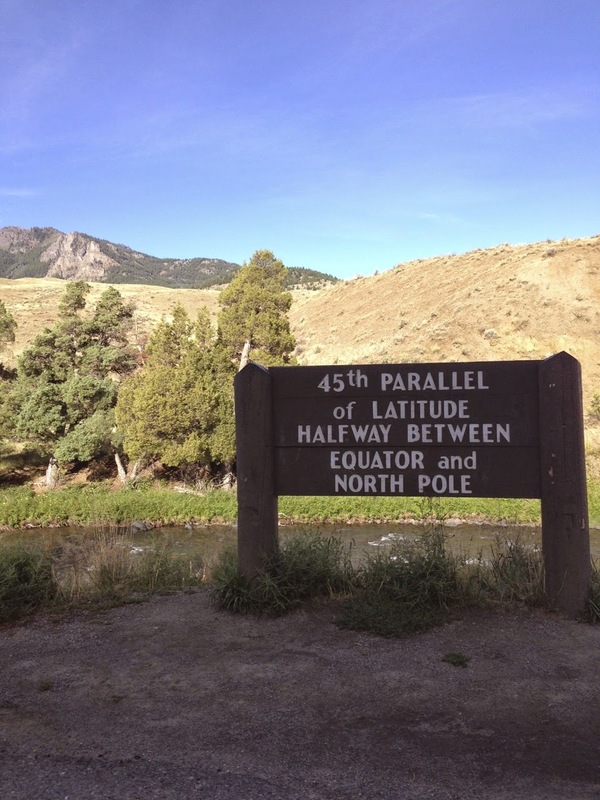 We took several photos of the sign, the arch the nearby sign marking the 45th parallel. Then we headed to Boiling River, home of a natural hot spring. It was a chilly morning, but we donned our bathing suits anyway, knowing we'd soon be in hot water. Literally. After an easy half-mile hike, we reached a shore of the river. To get from the shore to the hot spring, had to wade through the river a bit. The current of water we were trudging through was made up of a stream of cold water from one side that mixes with a stream of boiling water from the other side. A few times during this trek we had one freezing cold foot on icy rocks and the other foot flailing in the scorching water that was so hot it was impossible to stand on the rocks below. I strongly recommend water shoes of some kind for this journey. I made the trek in bare feet, but not without falling a few times, once in the scalding water and again in the freezing stream. Ack! Mrs. Tires navigates the freezing, scalding river. The journey was totally worth it, as its reward in the end is a pocket of water that perfectly mixes the hot and cold so you feel you're sitting in a whirlpool. The area can hold a good twenty or so people. We relaxed in the hot spring for a good hour or so and chatted with other visitors, including a family who had experienced a narrow escape when an elk charged their car, and a river boat guide who was full if interesting stories about encounters with wildlife in the park. We soaked until we pruned and then waded back to the trail. Upon emerging from the water, a snake slithered across the path. I was not pleased. I absolutely loathe snakes, an irrational but very real fear that I think extends from my name (Adam), the Garden of Eden, the serpent, all that. Not thirty seconds later, another snake appeared. 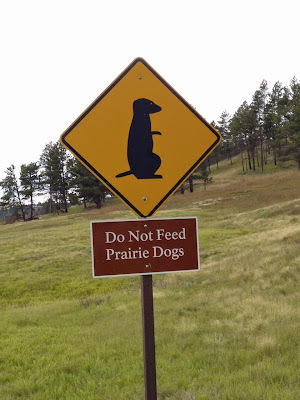 This made me quite nervous that Yellowstone would be crawling with them. Fortunately they were the only two snakes we would encounter on our trip, and neither of them offered me fruit of any kind. The next leg of our tour of Yellowstone was a trip down Grand Loop Road, a 140+ mile road which does a figure eight around the entire park and gives access to most of the main attractions. Our goal was to cover as much of it as possible. We knew it would be pretty much impossible to drive the entire figure eight because the south end of the road was closed for construction. 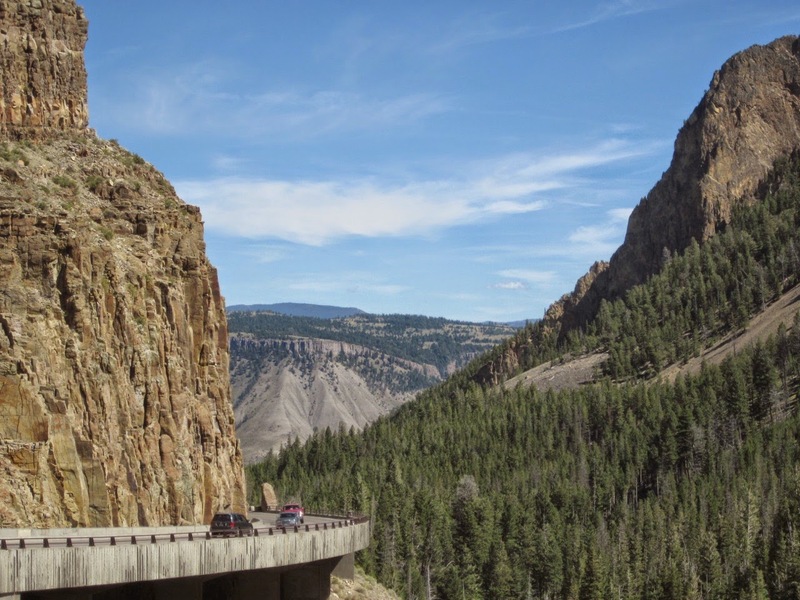 If it's tourism season, there will definitely be construction delays in the national parks. 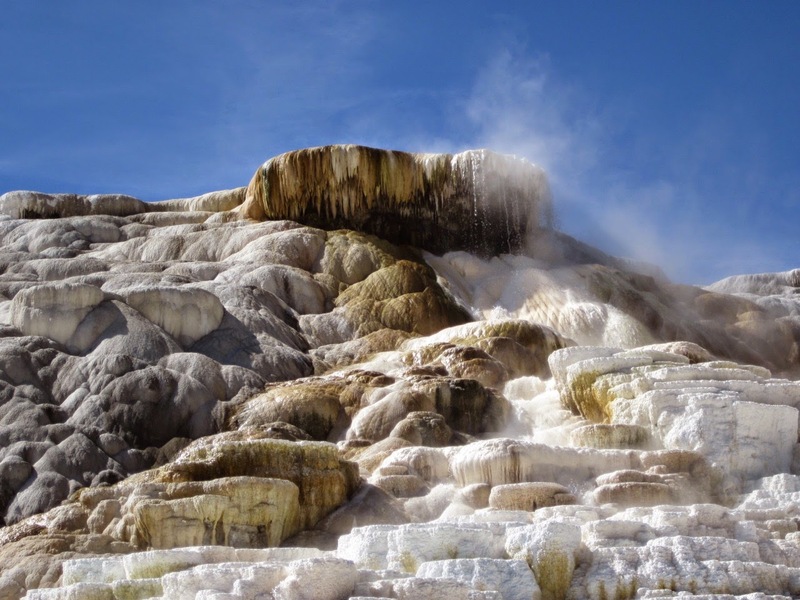 Our first stop on the road was Mammoth Hot Springs, a collection of huge formations with steaming pools of water at the top and creamy white ridges down the side that were formed over many years. The boiling water from Mammoth Hot Springs flows over the ridges and into the river we were just swimming in. From there we really got going. The drive was beautiful, with yellow rolling hills, thick forest and spouts of steam coming up from the ground. Part of the fun of the drive was watching out for wild animals along the way. There's something very primal about this activity. It felt as if we had awoken dormant instincts from the wild. We spotted several elk and a few bison during our drive. 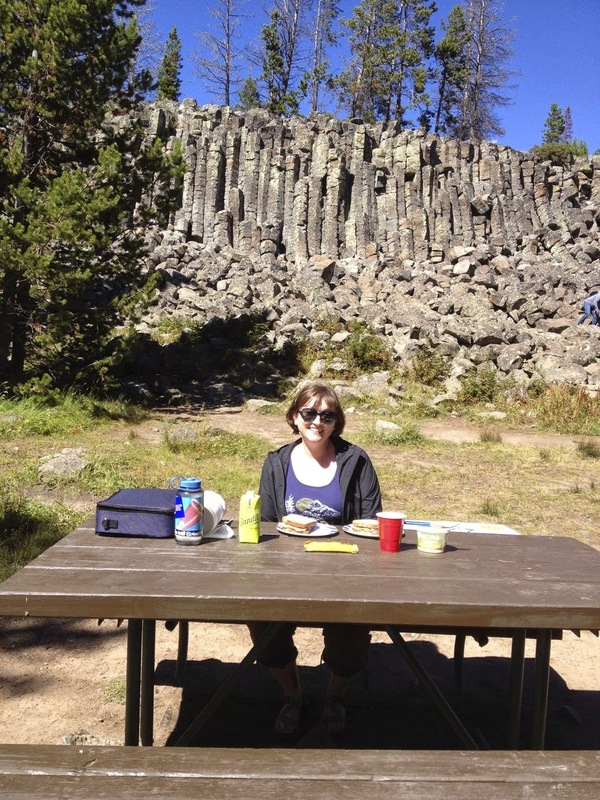 Other highlights of the late morning and early afternoon included a waterfall and a nice picnic lunch at Sheepeater Cliff. Next, we headed towards the upper, middle and lower geyser basins. 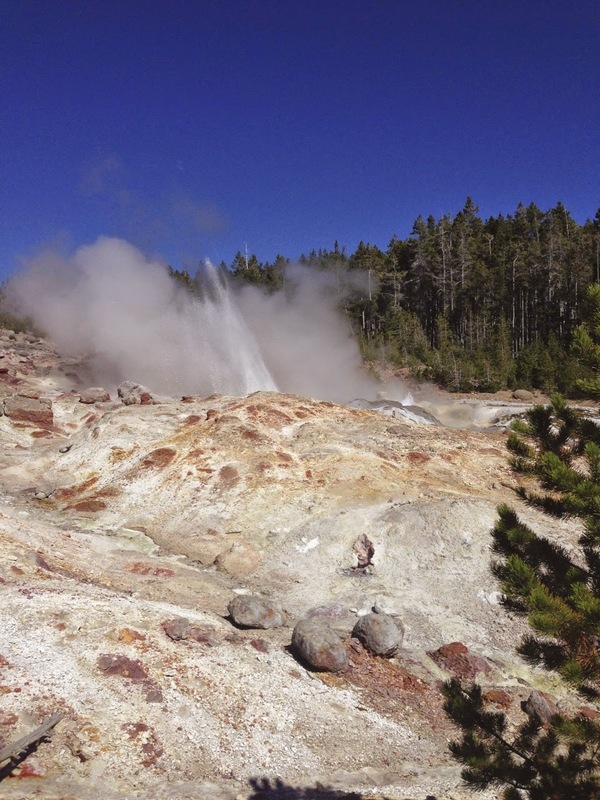 This geological hotbed is home to collections of amazing colored pools and geysers of all shapes and sizes. We hit the upper basin first, where we were drawn to Steamboat Geyser. This is the largest active geyser in the world, capable of eruptions three times higher than Old Faithful. Steamboat's eruptions are rare and unpredictable. The geyser can go up to forty years between eruptions. The last one had been about fourteen months prior. Larger geysers rumble, spit and spurt for a while before full eruptions. We overheard a tour guide tell his group that water spurts five to ten feet high were an indication of an impending eruption. We couldn't help but notice that the spurts looked about seven feet high at some points. As it turned out, Steamboat erupted later that night. Unfortunately it occurred after dark, so it had few witnesses. Still, we got some satisfaction from visiting it on the same day as this rare and unpredictable occurrence. 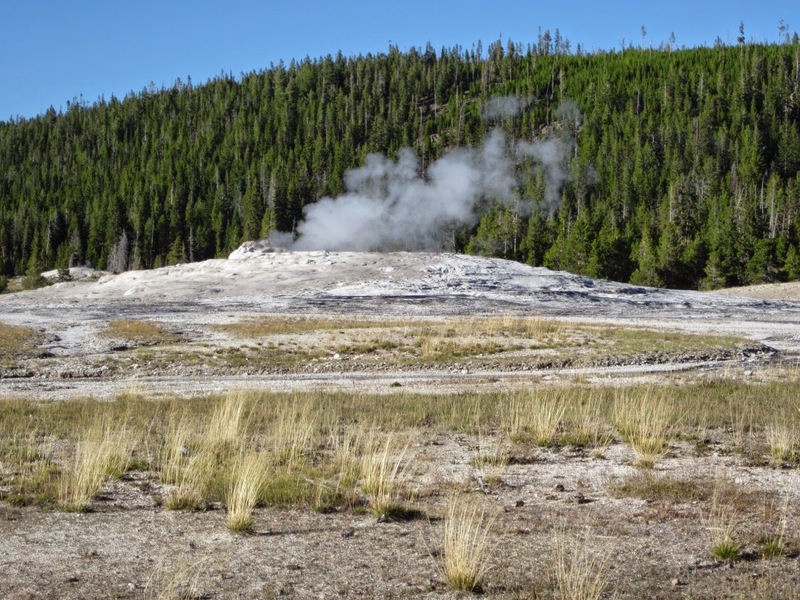 The other memorable geyser at the upper basin was the Vixen Geyser. One dedicated observer said it is typically dormant, but it has been spurting like crazy all summer. Vixen's eruptions were rapid and short, and they just kept going on and on. It was mesmerizing to watch and made us realize that Yellowstone offers many different types of geysers. Next up was the middle geyser basin. 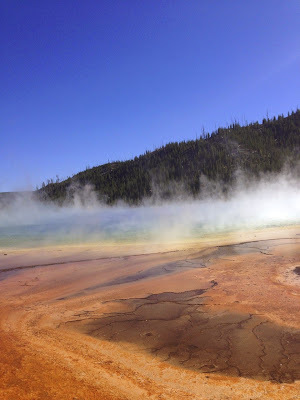 This one was high on my list, as it hosts the Grand Prismatic Spring. 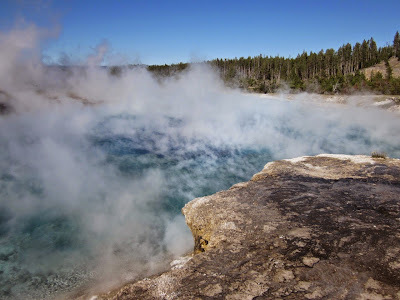 In addition to the geysers, Yellowstone houses several boiling pools of water that appear in rainbows of color and emit amusing amounts of steam. The Grand Prismatic Spring is the largest and most colorful of these pools. They're so massive that it's impossible to get the entire pool in one photograph from the main touristy vantage point. Regardless, these pools are serene, bizarre and amazing. They were definitely a favorite amongst our many stops. There's a nearby hiking trail called Fairy Falls that comes with a view of the springs. We had a burlier hike planned so we skipped this one, but it's a definite addition to the "next time" list. There was still so much to see, but before we knew it, the day was waning. 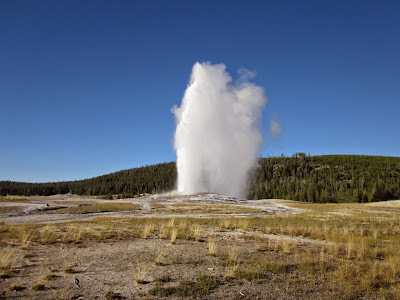 It was almost 5:00, so we passed over the lower basin to catch the last must-see attraction on our list - Old Faithful. 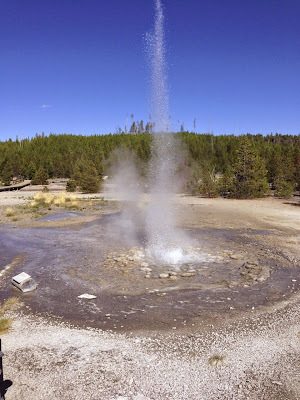 This is of course a very famous geyser, known for its impressive eruptions at predictable intervals. 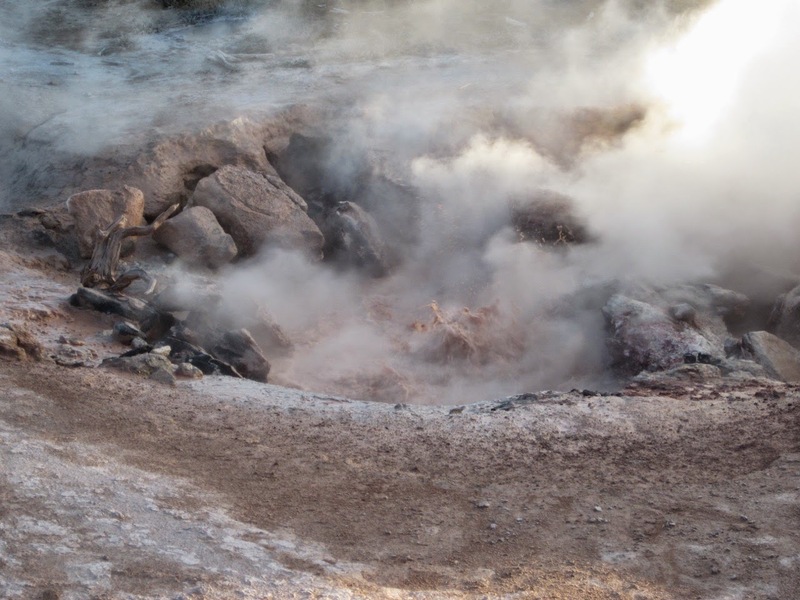 It erupts every 65-95 minutes, and an algorithm allows them to predict individual eruptions to within ten minutes. When we arrived, a sign informed us the next blow would be at 6:14. Our timing was not great as it was just a bit past 5:00. Should have known when we saw all the cars leaving the lot as we were pulling in. Fun Fact: There's a twitter account that broadcasts Old Faithful's next eruption: @GeyserNPS. 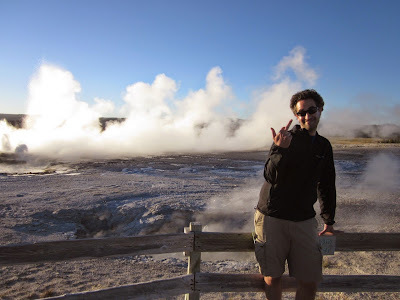 Not as Fun Fact: Yellowstone has cell phone service, but only in select areas, very few of which are close enough to Old Faithful for the twitter account to be of much use. We used our early arrival to secure a good spot on the famous benches that surround Old Faithful. As we watched the geyser give off a steady stream of light steam, we remarked that the benches were just how we pictured them and were famous in their own right. We also joked that a good setup for an end-of-the-world sci-fi movie would be that Old Faithful somehow failed to erupt. 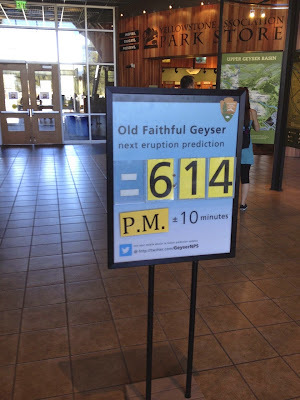 We were also enamored with they idea of predicting the eruptions, and I had a sharp eye on the clock to see how close this prediction would be. Sure enough, Old Faithful erupted at 6:14 exactly. It started with some teaser spurts, and then blew up with a burst of water and steam. It lasted a good minute and a half and then slowly died down until it was over. Not sure if it was appropriate or not, but I gave the geyser a round of applause at the end. 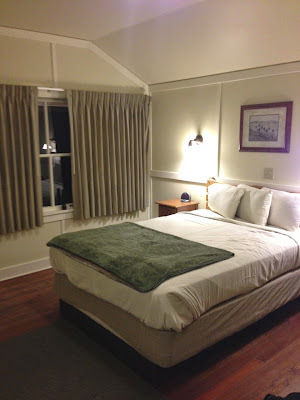 From there we poked our head into the Old Faithful Inn for a cup of tea and a lounge before getting back in the car. We knew we had a long journey back to our camp, and with the road to the east of us closed, we resolved to just head back the way we came. There was precious little time left for exploring, as wandering around Yellowstone after dark is frowned upon and we were weary already from the journey into the park.However, the adventurers in us kicked in and we decided to squeeze in a quick exploration of the lower geyser basin before heading back. 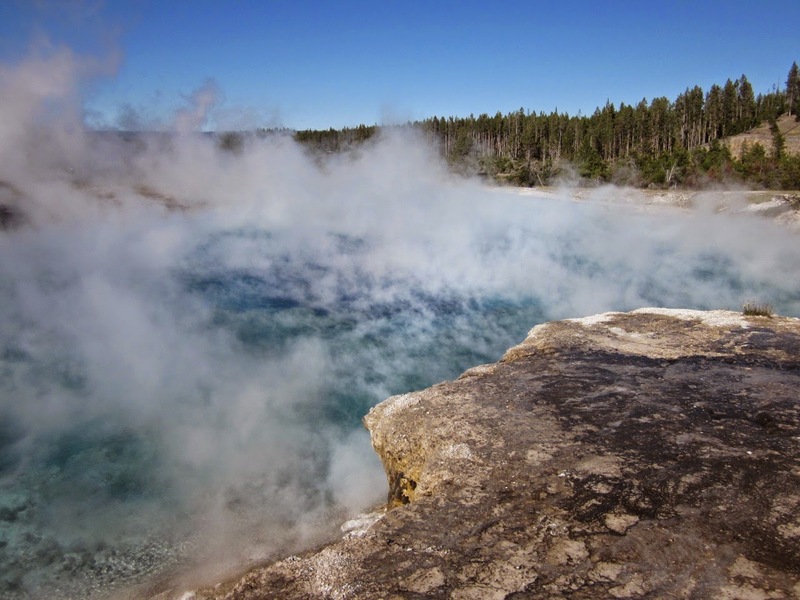 In addition to a few more steaming pools and geysers, the lower geyser basin houses the Fountain Paint Pots, another type of crazy geothermal phenomenon. These ones spout bubbles of odd-colored gurgling mud. At the end of the exploration of this basin I was getting a bit tired of dodging other people and started getting sassy. Perhaps I had tried to squeeze too much vacation into one day and was in trouble for being greedy, or maybe I was being punished for the rude gesture in the photo above. Or was it because I touched the Grand Prismatic Spring when I wasn't supposed to? For whatever reason, the park had it in for us, and we were about to endure the most treacherous drive of our two week road trip. Along the way were a million fellow tourists, each doing their own form of sightseeing while driving. Then there's the road itself, which can get very narrow and bumpy, especially near the construction. Speaking of construction, it was still going on, and at one point it brought us to a dead stop for almost an hour. Beyond that, there was the constant threat of animals jumping out of the woods at any time. 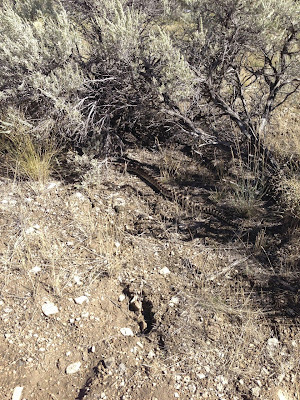 Though an animal sighting is always welcome, dusk is when they come out and get aggressive, and the shadowy trail and setting sun make it harder to spot them. Darkness eventually set in and added to the whole ordeal. I white-knuckled the entire drive, and it was really quite stressful and exhausting. I could barely speak by the time we got back to Mammoth. We were starving and really needed a beer. After a wait of what seemed like forever, I got my hands on a buffalo burger and a Montana beer called Moose Drool. Both of these were outstanding, and they took the sting out of the harrowing drive. For more on this trip, check out #raymansgowest on twitter.